Panrico is one of the most important food groups of Spain. The company produces sliced bread, many other kind of breads, all kind of cakes, pastries and biscuits, and of course, the well-known "donuts". Its products have been presence in more than 10 countries all around the world, being the market leader in Spain and Portugal. In 2010 it had a turnover of 563 million euros, 14 factories along Spain and Portugal, and 3.480 workers. At the present Panrico is going through a difficult time because of the crisis. Andreu Costafreda was born in 1909 in Alfarrás (Lleida). In 1928 he started his first bakery in Barcelona, that was growing little by little producing several kinds of bread. In 1952 he founded Costafreda y Sugarline, a company dedicated to produce and market products for bread flours. In the begining of 60´s, Mr. Costafreda traveled to United States with his partner Mr. Rivera, and there they met the well-known "donuts": a fried pastry with a hole in the middle and covered with icing sugar. It was a very popular pastry product in the USA, very consumed with a coffee or with milk, but it was unknown until the moment for the majority of the Spanish public. 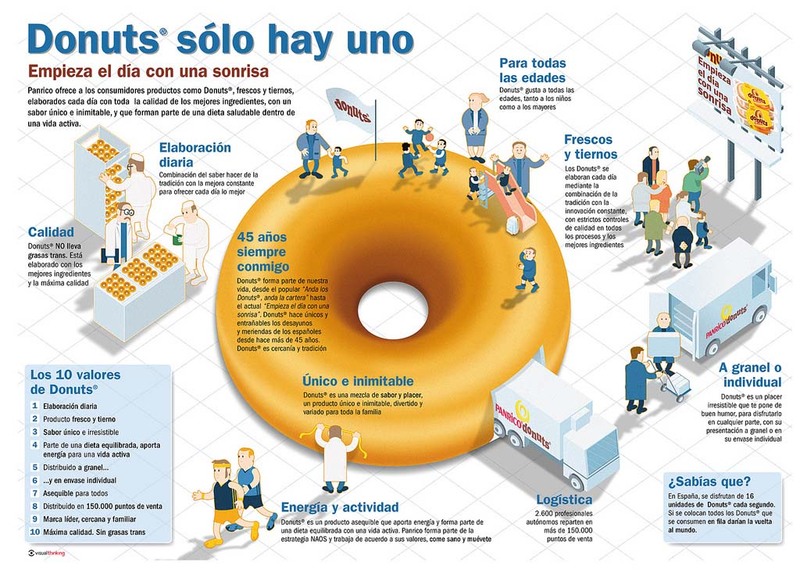 Then, they thought that it could be a good opportunity to introduce the donuts in the Spanish market, and decided to learn its producing methods and recipes, and bring the donuts here. In this way, in 1962 they set up Donut Corporation Española, a new company engaged on producing and marketing the donuts in Spain. It was a risky bet, because the consumption of donuts was an ingrained habit in the USA, but until the moment in Spain almost nobody had proved them. 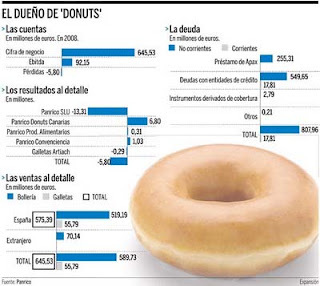 However, the Spanish people knew another pastry product quite simillar to the donuts: the bagels or "rosquillas". This would facilitate the introduction of the donuts into the market, because the Spanish people already would know its consumption ocassion. 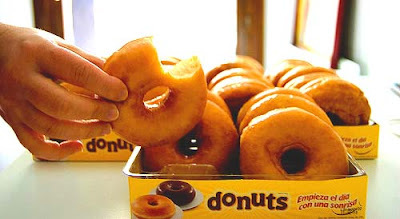 The donuts were seen like "rosquillas" but more tender and tasty, a delicious cupcake to have at the breakfast or like an snack, and the Spanish people started to buy them regularly. The donuts were a success, and Donut Corporation Española started to sell them by all over the country. The first factory was in Barcelona, and new factories would be opened time after. 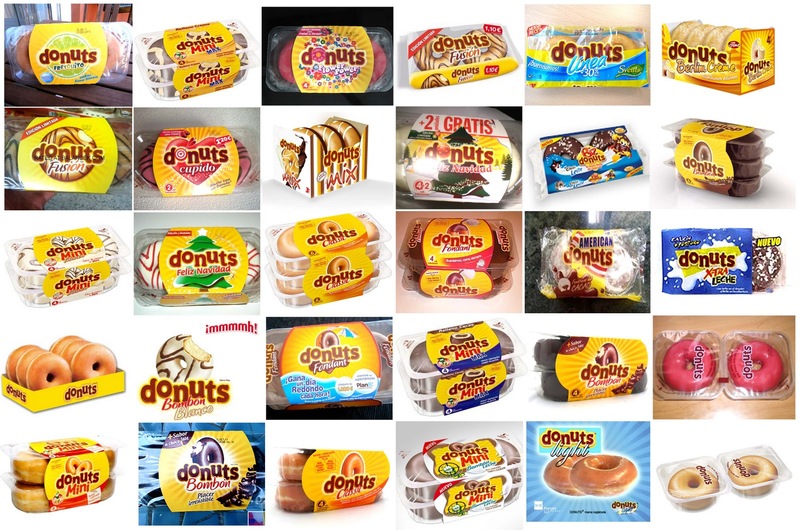 From the marketing point of view, Mr. Costafreda succeed with the registering of the generic name "donuts" like a trade mark in Spain. 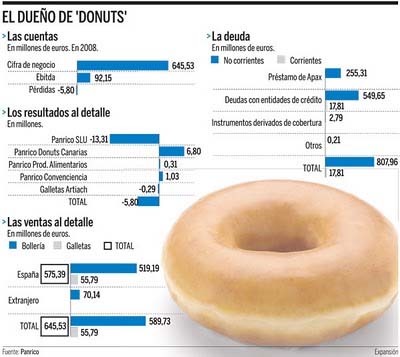 At that time it might be possible because the word "donuts" wasn´t known here. 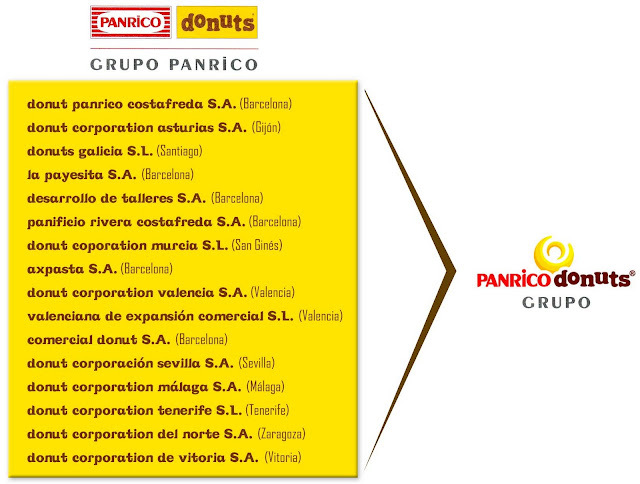 In fact, Panrico Group is the only company that can use the word "donuts" in Spain and Portugal. In the same year, Mr. Costafreda set up with the Rivera family another company, Panificio Rivera Costafreda (Panrico), engaged on produce several kinds of bread, as the sliced bread and the "Grisines", a kind of bread sticks. 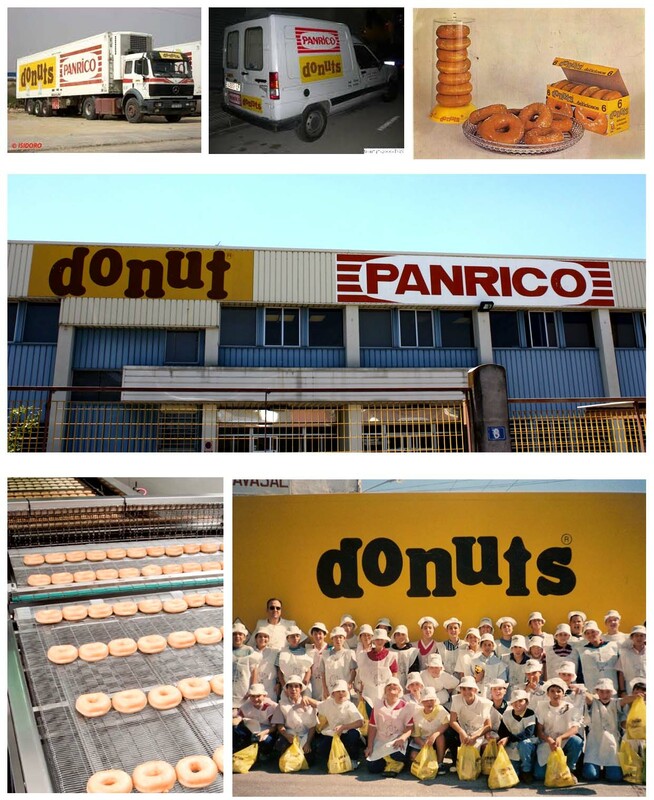 Both companies, Donut Corporation and Panrico would be the seed of the future Panrico group. The companies were managed by the Rivera and Costafreda families, who worked to make grow the business. In 1970 the company launches one of its more sucessful products, the "Bollycao", a bun filled with chocolate for a young public. The "Bollycao" became very popular among children and adolescents, and its sales soon grew largely. 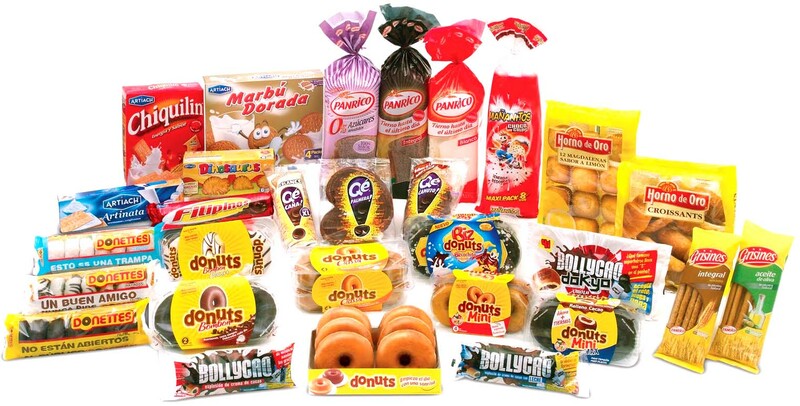 New products and varities were incoporated into its product portfolio, like the "Donettes" (a new kind of mini-donuts that were the first cupcake for sharing), the cupcakes segmented for boys and girls, the "Donuts Bombón" (donuts covered with chocolate), and several more products. Panrico´s products were introduced in the hospitality channel (cafes, bars, restaurants, communities...) and in the supermarkets, stores and kiosks. The company grew gradually by Spain setting up factories in several cities, in many cases with the participation of local partners by the creation of different subsidiaries. Furthermore, the group continued with its growth by the establishing of a delegation network along Spain, that allowed it to reach the final points of sale, and do an intensive distribution. 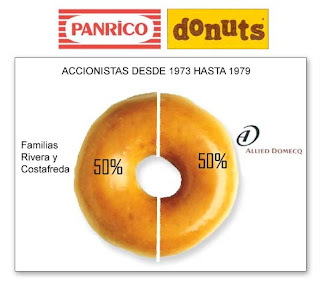 In 1973 the English food and beverage group Allied Domecq acquired 50% of the social capital of Panrico. Allied Domecq was an very important company that operated spirits, wine and quick service restaurant businesses. It was the owner of very known brands as Beefeater (gin), Ballantine´s (whisky), Malibú (rum) or Tía María (liqueur) among others, and its products had a strong presence in Spain. By this, it would be possible to exploit synergies. Since this moment, the Spanish company would be managed by three partners: the families Rivera and Costafreda with their English partner. The Costafreda family was interested in achieve that the group would grow not only in Spain, but selling its products to other markets. 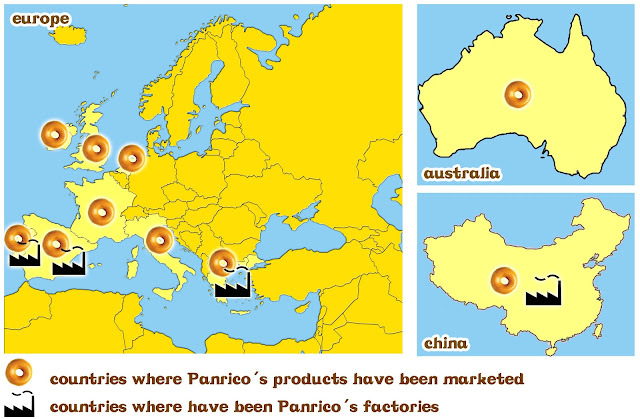 In fact, Panrico´s products were exported to other european countries like Portugal, France, United Kingdom, Ireland, Italy and Netherlands, and even to other more distant countries like Australia. In 1985 the Panrico Group opened its first factory abroad in Sintra (Portugal). 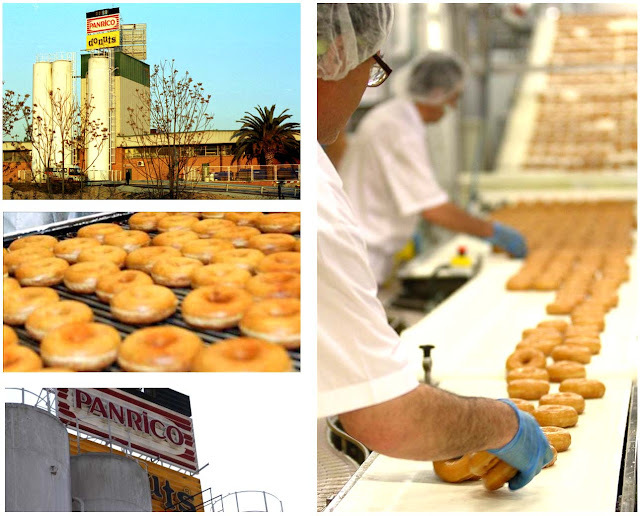 Following the growth strategy of the company, many Panrico´s products were marketed in Portugal, and they soon take the market leadership. A few years later, the owner of the "iberian donuts" would set up a second factory in Portugal, this time near to Lisbon. In the middle of 90´s, the food company had 11 factories in Spain and 2 in Portugal. By this time, Panrico (the only legal owner of the word "donuts" in Spain and Portugal) created with Allied Domecq a joint-venture to 50% to exploit the chain Dunkin Donuts along Spain. In 1997 the pastry group was introduced into the Chinese market, with the opening there of another factory that employed 800 workers. In this way, the Spanish company created a subsidiary, Beijing Panrico Food Processing Center, with the participation of the local group Song Zuhan Industrial. 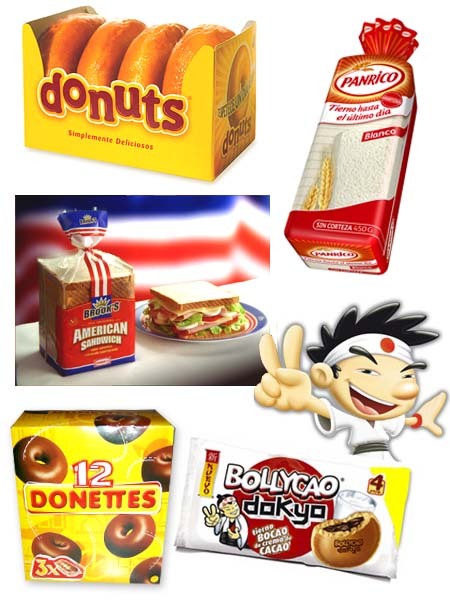 The Chinese plant was engaged on producing and marketing donuts (called there "Duo Na Quan", what means "the bagel of the abundance"), and more several pastry products like "Donettes" ("Xiao Duo Na Quan"), and buns filled with chocolate ("Duo Na Gao"). In China, Panrico also set up a distribution network with presence in the cities of Beijing and Tianjin. The company had an ambicious expansion plan over China that contemplated the opening of 20 factories in different cities all over the country, by exploiting the growing of China in the 90´s. But at the end, this plan would be cancelled. In 1999 the sales of the Chinese subsidiary reached 1.000 million pesetas (around 6 million euros). In 1999, the Costafreda family acquires again the share of Allied Domecq, and started the restructuring of the companies that belonged to Panrico. Along Spain there were several companies participated by Panrico and small regional partners that exploited the manufacturing and marketing of the Panrico´s products, including the donuts. 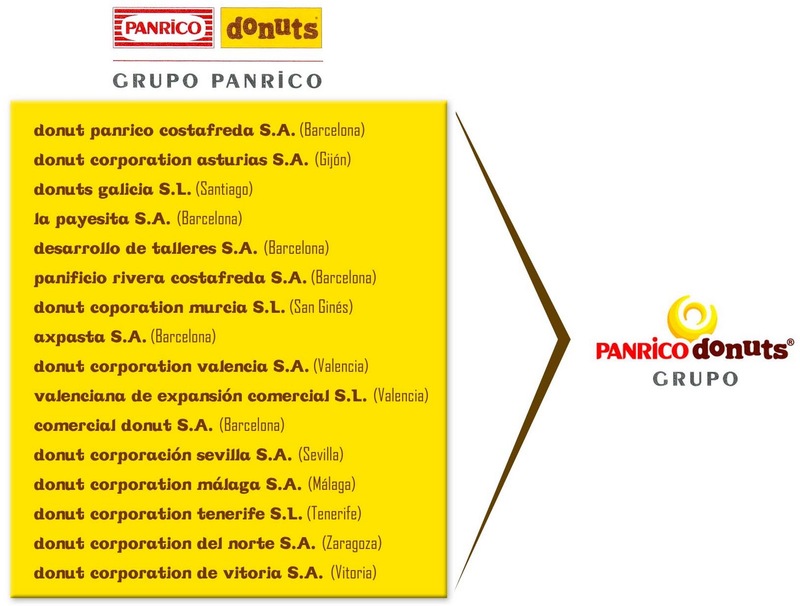 In this way, the new Panrico S.A. absorved all its subsidiaries as for example Donut Panrico Costafreda S.A. (Barcelona), Donuts Galicia S.L. (Santiago de Compostela), Donut Corporation Asturias S.A. (Gijón), Donut Corporation del Norte S.A. (Bilbao) and Donut Corporation Murcia S.L. (Murcia) among others. With this operation it was produced the unification of the group in only one company: Grupo Panrico. But also it was made a process of optimization and profitability of its facilities, and some factories were closed. In 2000, the company continued with its international expansion plan, introducing its products into the Greek market through the opening of a new factory in that country. As ocurred in China, the way to achieve this was doing a joint-venture with a local partner. In 2001 two new financial partners, La Caixa and Banco Sabadell, come into the company as shareholders acquiring 30% and 5% respectively. They were strategic partners (both were important Spanish banks) that would allow to finance the growth of Panrico. In 2004 it was created Panrico Conveniencia, an specific line of business to serve certain customers and stores, and the company also came into the frozen bakery and pastry market. By this time, Panrico sold its participation in Dunkin Donuts Spain, and this chain had to change its name to "Dunkin Coffee" to continue operating here. In 2005 Apax Partners, a British venture capital firm, acquired 75% of Panrico capital by 900 million euros. The old stakeholders were the Costafreda family (who sold 45%), and La Caixa (who sold 30%). The Costafreda family would preserve another 10% by the moment, although at the end of the year Apax Partners would purchase 100% of the Spanish company. Other companies had presented to the bid of Panrico: Permira, Mercapital (venture capital), the French company PAI, and CVC, although at the end the Apax Partner´s offer was the winner. Since Apax Partners took the control of the company, the course of Panrico would change drastically. The venture capital company wanted to turn the pastry manufacturer in the undisputed leader of the Iberian Peninsula, and diversify into other food sectors like biscuits. In 2007 the company had to sell four of its production plants to reduce its debt. But Panrico could continue producing in them because the sale was done with a lease (a rental contract) during several years more. 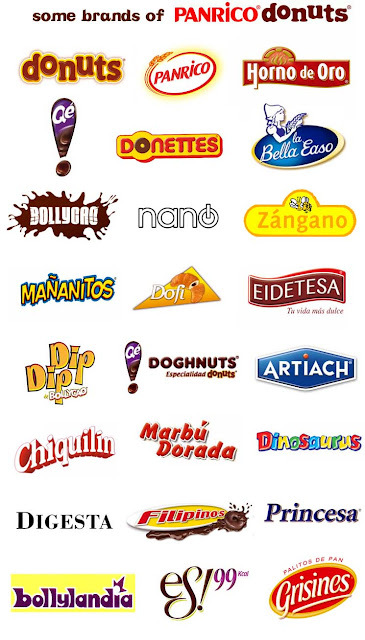 Following its diversification strategy, Panrico acquired in 2008 a big part of the biscuit business of Kraft Foods, with the purchasing of one product plant in Orozko (Vizcaya) -with 240 workers- and well-known brands like Artiach, Dinosaurus, Chiquilín, Digesta, Filipinos and Marbú among others. 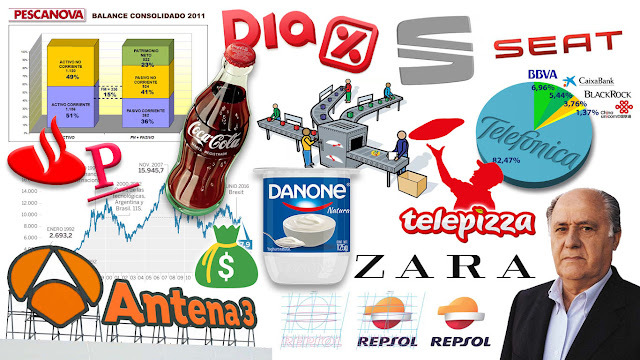 All these brands had a maket share of about 12%, and a big part of this important operation was financed with debt. But furthermore, in 2009 Panrico purchased another important pastry company by 25 million euros, La Bella Easo, until the moment owned by the italian group Barilla. La Bella Easo had an important presence into the Spanish market, being very strong by producing fairy cakes and other kind of pastry. But the problems didn´t anything else but grow, because Panrico embarked on a conquering adventure with a not very good financial situation (it had a high level of indebtedness), in a moment in which the market and the consumption started to contract because the crisis, and the sales decreased year by year. To be able to afront this situation, Panrico started a desinvestment policy abroad with the sale of its factories in China and Greece, ceasing to export, and concentrating its business and its efforts in the Iberian market (Spain and Portugal). In China the plant was sold to Bimbo México by around 9 million euros, and in Greece the local parter acquired the share of Panrico. The company was heavily indebted, the sales continued decreasing, and the profits became in losses. Panrico had a hard situation largely due to the crisis: the consumption was contracted and the raise of white brands in the supermarkets was causing a significant reduction in margins. This kind of products are cheaper and leaves a lower profitability to the producer. In 2009 the company had a debt of 605 million euros (that almost overcomed the turnover), with a total turnover of 631 million euros (2,2% less than the year before), an EBITDA of 76,3 million euros (17,2% less than 2008), and losses of 149 million euros. The financial situation was bad, with a negative working capital of 645 million euros, and an equity (patrimonio neto) with a low representation of 252 million euros. In fact, the equity of the Spanish company wasn´t negative due to the equity loans (préstamos participativos) that Apax was doing repeteadly, but the real situation was that Panrico was a bankrumpt company. With this situation, in 2010 the company could not afford the pay of its debts, and Apax Partners (its only owner) refused to invest more capital to refloat it. Then, the English company agreed with the creditors (the majority were banks that had financed its debts) that they would be the new stakeholders of Panrico. In this way, it was a conversion operation of credit in capital: Apax changed its participation in Panrico by debt, and ING Bank, BBVA, Santander, Bankia (Caja Madrid), Credit Suisse, Goldman Sachs, BayernLB, Banco de Sabadell, La Caixa and other creditors became the new owners of the pastry company. All they created a new company in Louxembourg, Bake Holdco 4, to join its shares in Panrico. A new partner else interested in the Spanish company appeared in the middle of all these movements. It was an U.S. investment fund, Oaktree Capital, specialized in the refloating of companies in a crisis situation, and it made a bid for a share in the company. By this, in 2010 the creditor banks stayed with 76% of the company, while Oaktree Capital would have the remaining 24%. The new board of directors appointed a new CEO (general manager), César Bajardí to try to refloat the business progress. In this way it looks like that things are starting to be redirecting because Panrico was able to refinance its debt, reducing its debt level from 650 million euros to 350 in 2010, and deferring payment of debts by an average of 2 years more. But Oaktree Capital also showed to the banks its interest in increase its share in Panrico until 80% of the capital, and it has offered an injection of 105 million euros in the capital of the Spanish company. At the end of 2011, Panrico is conducting an strategy for restoring profitability and be able to go through the crisis. In 2004 (before the crisis) Panrico had an ambicious plan of expansion: the company wanted to double the turnover from 566 million euros to 1.000 million in 2010, and increase the EBITDA from 83 million euros to 200 million in the same period. But the crisis started and the plans were changed drastically. The case of Panrico isn´t the only one in serious problems. With the crisis many food companies are going through by difficult moments. It is also the case of the main competitor of Panrico, Bimbo España, that has been put on sale by its actual owner Sara Lee. Apparently the crisis is affecting hardly to the food companies. Panrico has several brands very well positionated in the market, overall in Spain and Portugal. 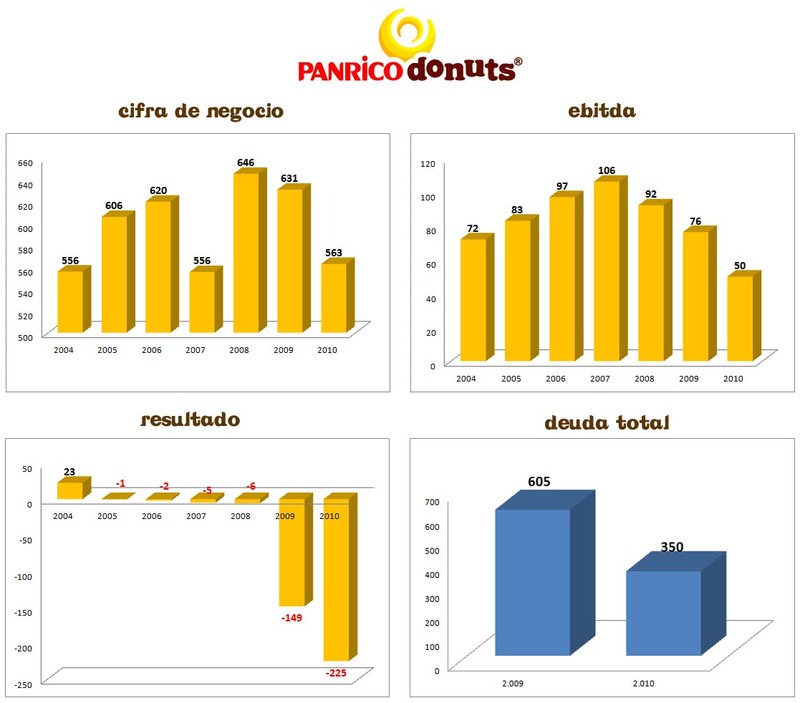 Donuts is one of the most famous brands in the Iberian food market, being the undisputed leader in its segment, and Panrico sliced bread has the second position in the ranking, just behind Bimbo. The company invests large amounts of money in advertising throughout the entire year, being one of the main advertisers of Spain. The communication campaigns are needed to stimulate the demand (launches of new products, reminder ads, brand image creation, etc.). Each time a new television advertisement is broadcasted, sales experiment important peaks, and many times the new products advertised on tv are totally sold. In addition to advertisement campaings, designed to stimulate the demand and increase sales in the short term, Panrico also does promotional actions like to offer direct gifts, awards and collectibles with its products, to achieve consumer loyalty and repeated purchases by them. This is an example of the importance of a good communication policy in products consumed by impulse, due to the marketing strategy influences directly on sales. In relation with its product policy, Panrico continuosly developes and launches new products and varieties of its products, to stimulate the demand, and to reach new public segments. 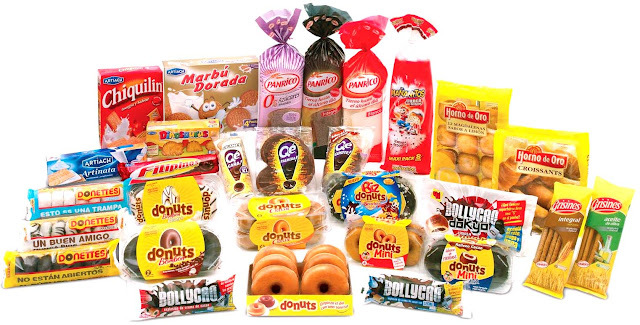 For example, we can remeber the large number of varieties that the "donuts" have had: donuts glacé, donuts bombón, mini-donuts, donuts-light (and later donuts-línea), donuts xtra leche, donuts fusión, donuts limón (for the summer), donuts feliz navidad (for christmas), donuts cupido (for february), American donuts, donuts fondant... and a many varities more. Last October 2011, two of the most important producer groups of frozen products have announced its intention to make a fusion. 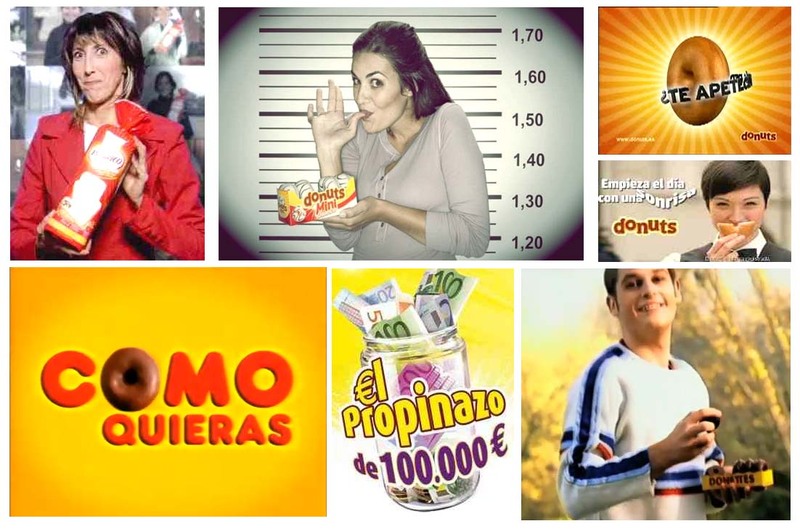 In this way, Promar and Frigoríficos Fandiño will create the 5th largest company of frozen food in Spain. The new company will be called Profand Group, and it will have a total turnover of around 160 million euros, 7 big factories -3 of them in Spain (Vilagarcía, Sada and Avilés) and the other 4 located abroad (in Peru -2-, Argentina and Senegal)-. It also will have a big fleet of ships that operate in the best fisheries of the world (Nord Atlantic, Peru, Argentina, Estonia...) and commercial offices in several countries. At the present, in the top of the ranking it is located the huge Pescanova Group with 165,000 tonnes of frozen food produced, followed by Pescapuerta Group (with 76,000 tonnes produced) and Freiremar Group (with 55,000 tonnes). 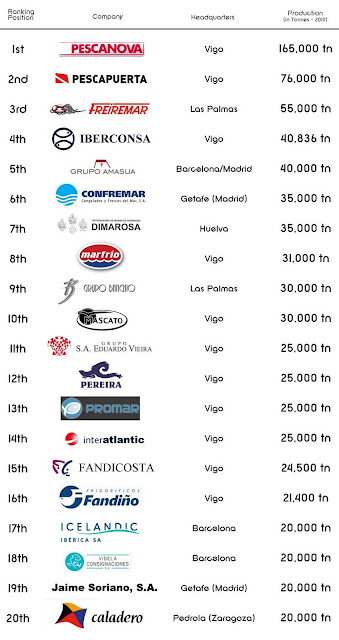 Pescapuerta has been able to get the second position in the ranking because of the acquisition of Ultracongelados El Mar, a big company with a well-stablished brand in the market ("El Mar") that now belongs to the group based in Vigo.